The park is one component of the larger Universal Orlando Resort. In 2010, the park hosted an estimated 5.9 million guests, ranking it the eighth-most visited theme park in the United States. A major component of the original park in Hollywood is its studio tour, which featured several special-effects exhibits and encounters built into the tour, such as an attack by the great white shark from the film Jaws. 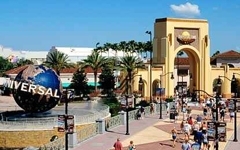 For its Florida park, Universal Studios took the concepts of the Hollywood tour scenes and developed them into larger, stand-alone attractions. As an example, in Hollywood, the studio tour trams travel close to a shoreline and are "attacked" by Jaws before they travel to the next part of the tour. In Florida, guests entered the "Jaws" attraction and would board a boat touring the fictitious Amity Harbor, where they encountered the shark, then exited back into the park at the conclusion of the attraction. Over the years, Universal Studios Florida has not limited itself to attractions based on its own vast film library. It has occasionally licensed popular characters from other rival studios, many of whom did not operate theme parks themselves. Some examples include the Ghostbusters and the Men in Black (from Sony's Columbia Pictures), Jimmy Neutron (from Viacom's Nickelodeon), The Simpsons (20th Century Fox), and Shrek (from DreamWorks Animation, now part of Paramount Pictures). Many of the park's past and present attractions were developed with the actual creators of the films they were based on, and feature the original stars as part of the experience. Steven Spielberg, a co-founder for the park, helped create E.T. Adventure and was a creative consultant for Back to the Future: The Ride, Twister...Ride it Out, An American Tail Theatre, Jaws and Men in Black: Alien Attack. Many of the original stars reprised their film roles including Christopher Lloyd and Thomas F. Wilson in Back to the Future: The Ride, Bill Paxton and Helen Hunt in Twister...Ride it Out, Rip Torn and Will Smith in Men in Black: Alien Attack, Brendan Fraser for Revenge of the Mummy: The Ride, Christopher Walken and Dwayne Johnson in Disaster!, the cast from Shrek returned for Shrek 4-D, various Nicktoons voice actors reprised their roles in Jimmy Neutron's Nicktoon Blast, Roy Scheider recorded a voice over for the conclusion of Jaws, William Hanna and Joseph Barbera made appearances in The Funtastic World of Hanna-Barbera while Hanna-Barbera voice actors reprised their roles in the same ride, Alfred Hitchcock and Anthony Perkins appeared in Alfred Hitchcock: The Art of Making Movies, Arnold Schwarzenegger, Edward Furlong and Linda Hamilton reprised their roles for Terminator 2: 3-D Battle Across Time and even Charlton Heston made an appearance in the pre-show for Earthquake: The Big One.